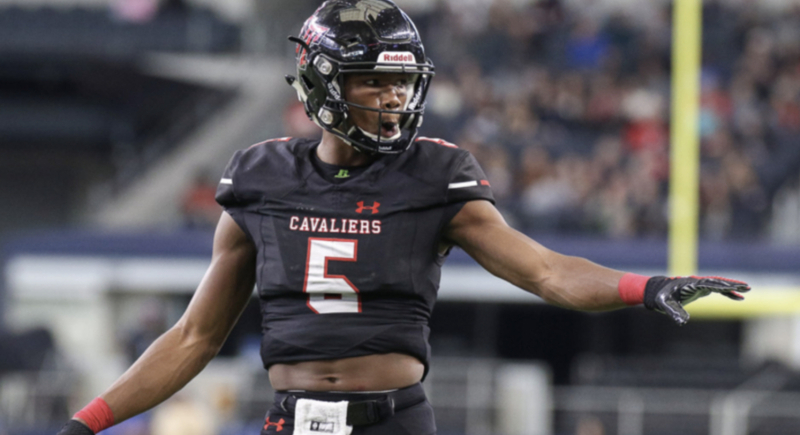 Ohio State commit Garrett Wilson, a five-star wide receiver from Austin, Texas, has agreed to give Eleven Warriors exclusive access into his senior season with the Cavaliers. He'll join us every week to assess his own play, as well as his team's, while giving Ohio State fans continuous updates as his senior prep season rolls along. Wilson's eighth entry comes after Lake Travis handed Anderson a 56-14 loss. The win puts the Cavaliers at 9-1 overall before a first-round playoff game, as they host Smithson Valley. It's been quite some time since Garrett Wilson has been healthy enough to contribute in Lake Travis' offense ... way too long in his own mind. To be exact, it's been since Oct. 12. Since that time, Wilson has cheered on his teammates from the sidelines as a back injury has kept him in street clothes. But that all changes this week. With playoff football upon the state of Texas, Wilson plans to strap up and do what he's always done so well; lead the way to victory on the biggest of stages. "I am planning to play and do my job to lead us to a win," Wilson said. "[The state championship] is the goal, and if we play the way we’re coached, we will get there. We’re playing at home this week so there’s a lot of excitement around our last home game." After making a run to the state championship game last season — where they eventually fell to Allen by a 35-33 final — Wilson's Cavaliers will start this year's playoff run hosting Smithson Valley, a program that enters the postseason at 5-4. "Smithson Valley plays really hard, and flies to the ball. We have to match their energy," Wilson said when asked what was needed to advance. And, of course, when you're talking about high school football playoffs in Texas ... well, it's as the saying goes, "Everything's bigger." "In Texas, the whole community comes out to support the team," Wilson said. "That’s what I’d say is different [from other areas around the country]." While Wilson's focus has been on Lake Travis' first-round playoff contest, his future teammates are focused on Maryland this weekend. But this week hasn't been an easy one, considering the off-field distractions that have attempted to present themselves. The Buckeyes, respectively, have seemed to handle those well and keep focus. However, distractions like this week's could certainly get inside the minds of recruits thinking about choosing Columbus. Wilson has a message for those prospects. "The message to recruits is that anyone can say anything on social media and appeal to audience," he said. He's not wrong. "Appealing to audience" is sometimes more important than the actual truth ... much like it was this past week. As for Ohio State's chances in College Park, and further down the road, Wilson is confident that the Buckeyes are still right in the thick of things. "I predict the Buckeyes to take care of business and get it done [against Maryland]," he said. "If they win out, there’s no doubt to me that they’ll be in the playoffs."